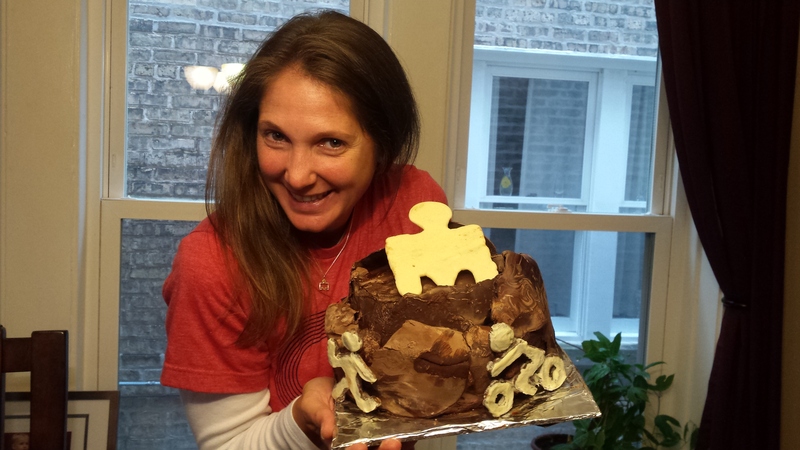 If ever anyone earned themselves a cake, it’s an Ironwoman. Our friend Victoria completed the Chattanooga Ironman in September, and she rocked it, finishing in under 12 hours (a “daylight” finisher, which is a big deal). She was in training pretty much all year so didn’t get to enjoy many of the other cakes, so I promised her the October cake would be a super chocolatey treat to celebrate her accomplishment. How Chocolatey Could I Go? The Cake Bible has an epic-looking Triple Chocolate Cake in its “Showcase Cakes” section. It calls for light whipped chocolate ganache covering a moist chocolate génoise, drizzled with Frangelico-flavored syrup and enveloped in chocolate praline sheets. Epic. And since I learned about the importance of tempering chocolate back in August, this would be a great chance to try it on some ironman-themed decorations. Génoise (jen WAHZ) is a sponge-type cake typically flavored and moistened with syrup. The Cake Bible goes in-depth about the differences between it and butter cakes, but I will just say that it is not as complex as the fancy-sounding name makes it seem. Having never attempted a génoise, I followed that recipe from the Cake Bible as written and it turned out perfectly, with one exception I’ll describe below. As for the other ingredients, Ironwoman and I agree that bourbon is superior to Frangelico, so I used Maker’s Mark to flavor the syrup, and I omitted the praline from the chocolate sheets. Other than that, I basically just followed the instructions. If you want to watch someone else following the instructions (or not — I haven’t actually watched the video to confirm), The Aubergine Chef has a YouTube video about this cake. 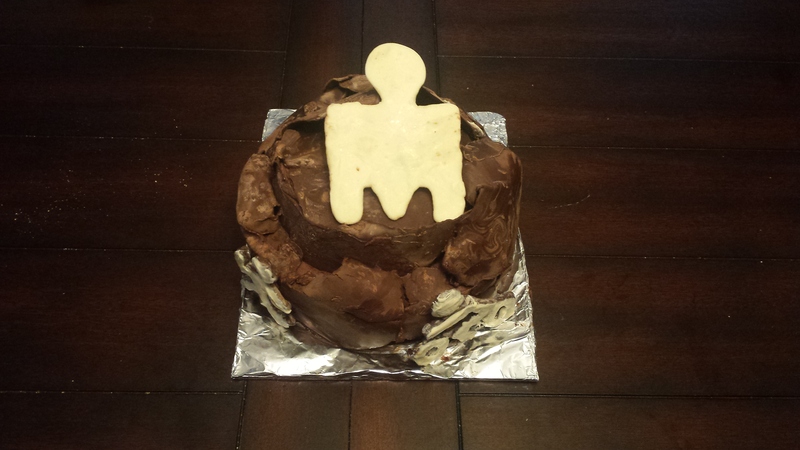 Obviously a chocolate cake enveloped in chocolate would have been sufficient, but since this cake was celebrating a particularly remarkable event, I wanted to include some Ironman images in the design. Let me pause to explain an Ironman for those who aren’t aware. First you swim 2 miles in open water, which is about 1.9 miles more than I would ever want to swim. After that you hop on a bike for normally 112 miles, but for some reasons that made sense to the Chattanooga organizers, they altered the route to make it 116 miles. Yes, they ADDED 4 MILES to the event, which makes Vic’s daylight finish even more amazing. After you finish that extra long bike ride, you then RUN A FULL MARATHON (26.2 miles). You see what I mean when I say this woman earned a cake? 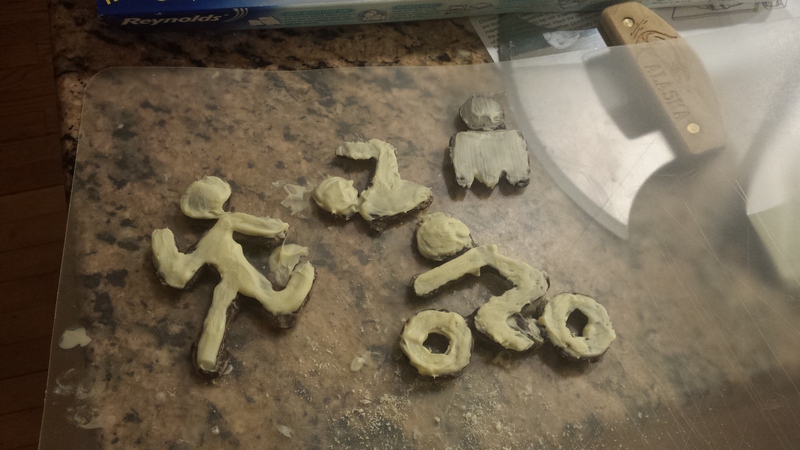 Anyway, so I wanted to include icons from the 3 events on the cake somewhere, but I couldn’t find any good candy molds or cookie cutters to use with my soon-to-be-tempered chocolate. Logically that would be the point to revise my plan, maybe back to something like the chocolate lace wraps or royal icing transfers, but instead I decided that it might work to make my own molds. The internet confirmed that brown sugar or flour or corn starch might work. Flour is the cheapest and in the greatest abundance in our kitchen, so I decided to start with that. Before I go into the actual modeling process for the chocolate, a quick note on tempering itself. If you melt chocolate and don’t intervene as it cools and re-hardens, it will be “out of temper,” which means it won’t be as hard and stable as it was initially, and it will look weird. Think about the satisfying snap you get when you crack a high-quality chocolate bar in half. That occurs thanks to the molecular structure of the chocolate (which is in temper when you buy it). When you melt it the structure gets messed up, and if you don’t re-temper it, it will be soft, not snappy, and prone to melting, and will have weird patterns in it. 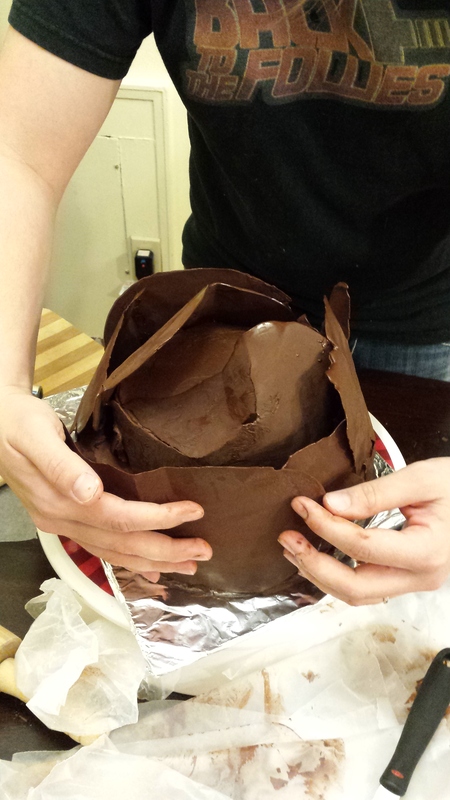 There are plenty of video tutorials online about tempering chocolate. I watched what felt like almost all of them and decided to use what the Cake Bible refers to as the “quick tempering” method. This method only requires a microwave, a non-glass microwavable dish, and a food processor or excellent knife skills. Some chocolatiers insist on a more elaborate method involving a marble slab and some intricate working of the melted chocolate, but for most purposes the microwave method will do just fine. Chop your chocolate finely. 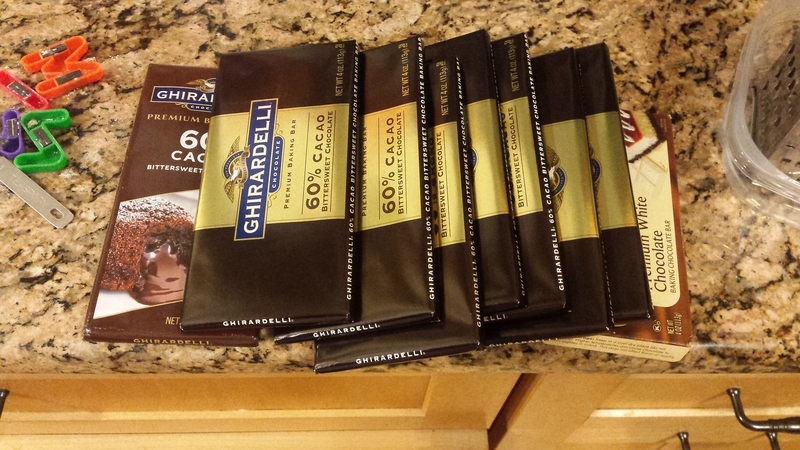 Use a food processor, unless you are awesome with a knife and can get all of the chocolate exactly the same size. You can’t. I tried, and it was my ultimate downfall. Just use a food processor. 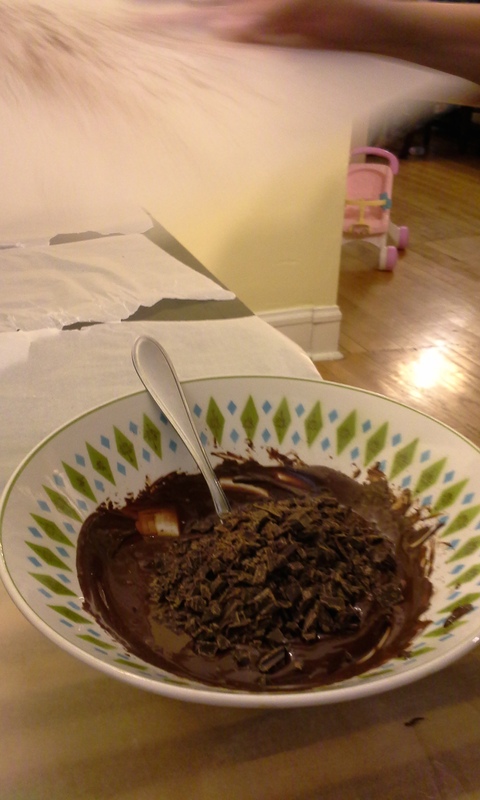 Put 2/3 of the chocolate into the non-glass* bowl and microwave at 10 second intervals, stirring after each, until it is just melted. *The reason not to use glass is that glass will retain heat and keep warming the chocolate after you want it to stop, which will take it back out of temper. 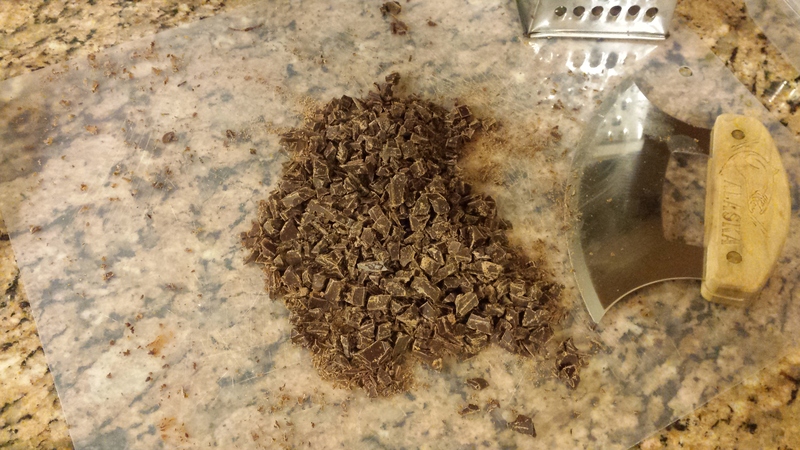 Once your initial chocolate is melted, stir in the remaining 1/3 of your chopped chocolate. If chunks remain, return to microwave at 5 second intervals, stirring well between intervals, until it is smooth. As will be revealed below, my chunks were too large for this stage, which meant that I had to microwave them too much more to get them completely melted so they pulled the other chocolate out of temper. More on that later. 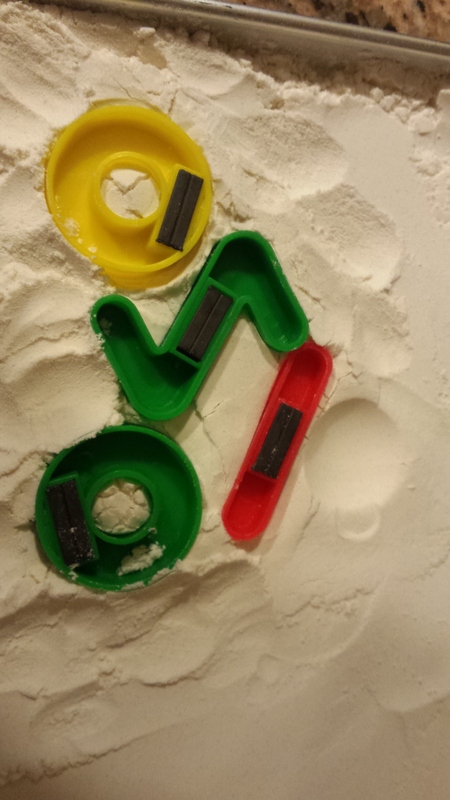 If you really can’t find a candy mold that suits your needs, a pan of flour can do the job. I used the small metal pan that came with our toaster oven. 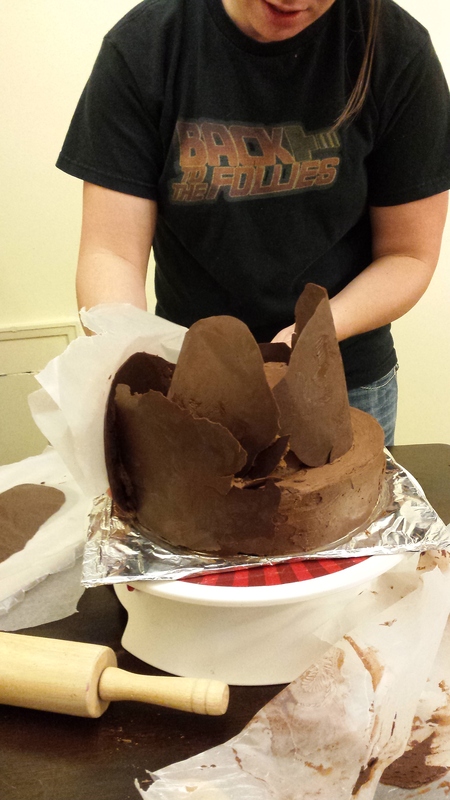 After making all the molds, I tempered the chocolate as described above and carefully poured it in. Note: I did this all several days in advance, to give me time to revise the plan after the inevitable failure. Of course, it would have been ideal to have been able to prevent the flour from sticking to the chocolate. Maybe cooking spray would have helped? 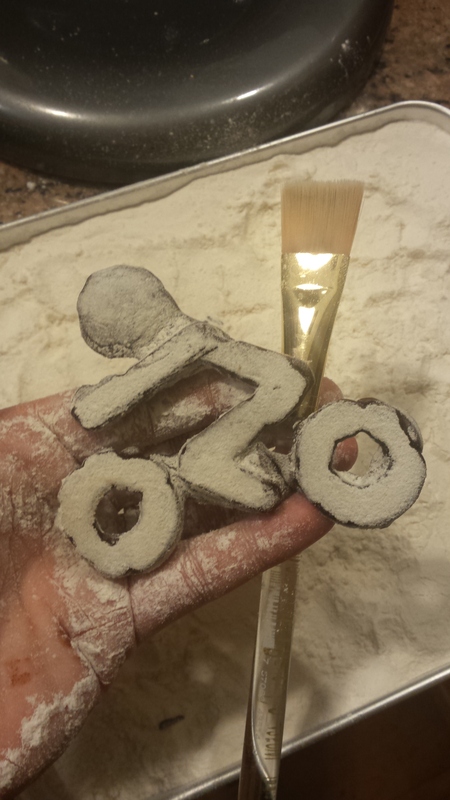 Instead I used a dry paintbrush to dust off as much flour as possible, and then a wet brush to get the rest. 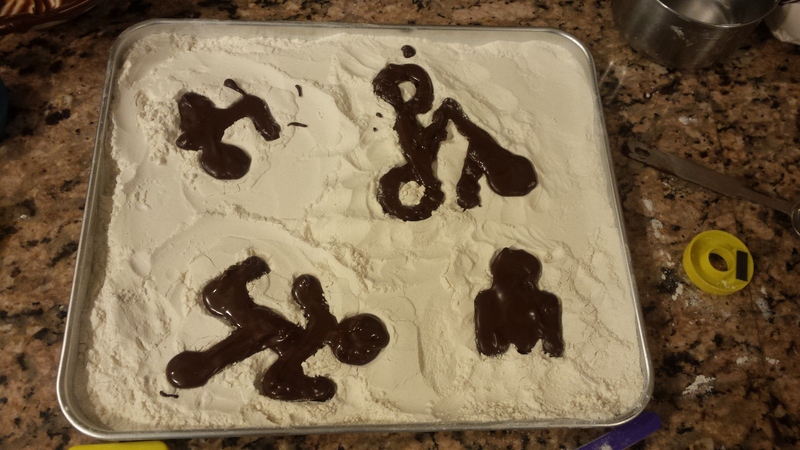 It was still slightly off color, so after I made a full-sized white chocolate Ironman logo for the top of the cake using the same method, I brushed the leftover chocolate onto the icons for a two-toned effect. As I alluded to earlier, there was one slight problem with the cake as described in the Cake Bible. The instructions said the batter would fill two 9×2 round pans about 2/3 full. Inexplicably, I had a lot of extra batter. Enough that I put some into a 6″ round pan, so I had 3 layers. I frosted and stacked them, and it was all going well. 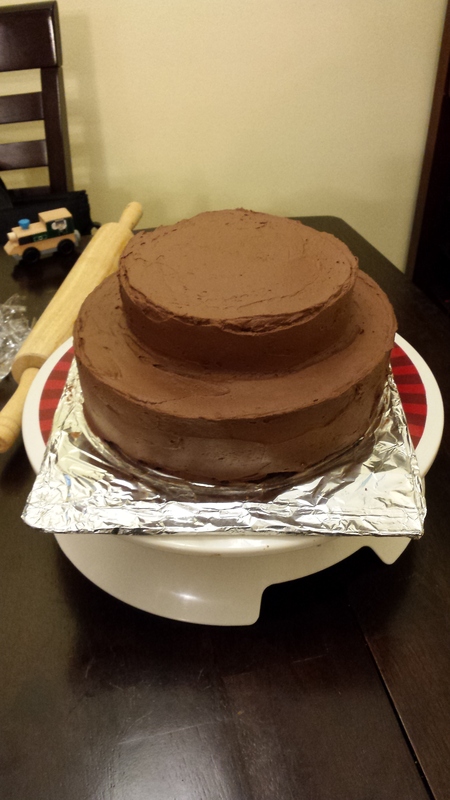 The chocolate sheets around the cake are meant to be freeform anyway, and this extra tier would give me room to place the chocolate pieces I’d made. 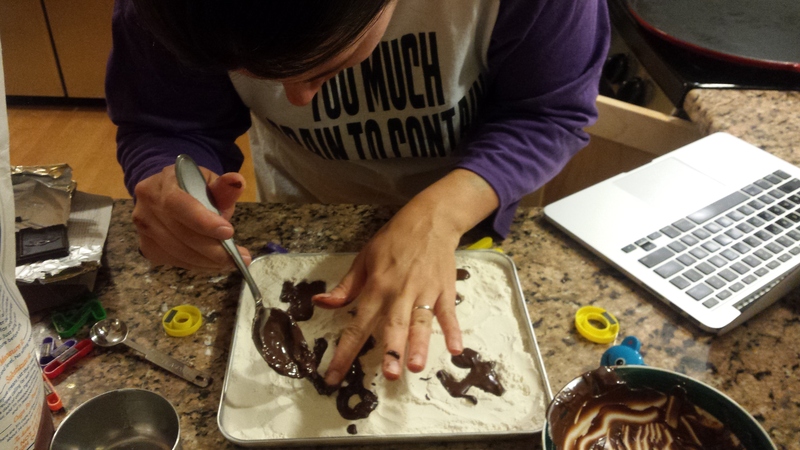 To make the chocolate sheets, I spooned the melted tempered chocolate onto half a dozen sheets of wax paper, covered them with another sheet of wax paper, and then rolled them flat with a rolling pin. I let them cool for a few minutes before carefully placing them around the cake. 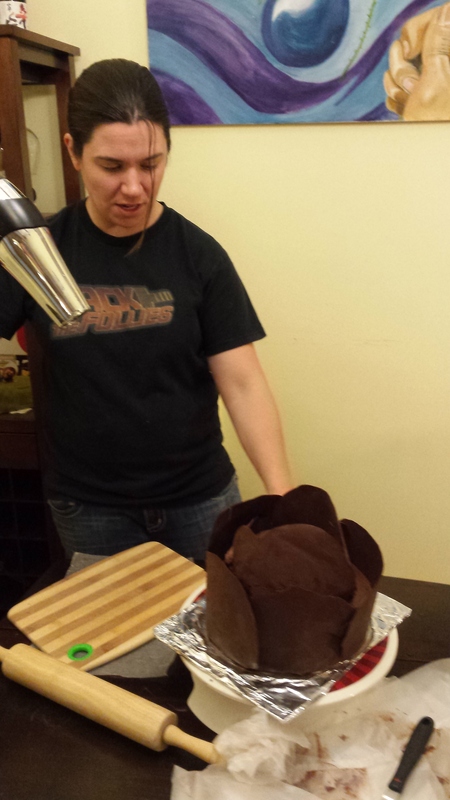 It was going okay, but then the sheets were supposed to melt and undulate around the cake. But they didn’t. So the Cake Bible suggests fanning a blow dryer over them. So I did. And then it didn’t. Pieces cracked. 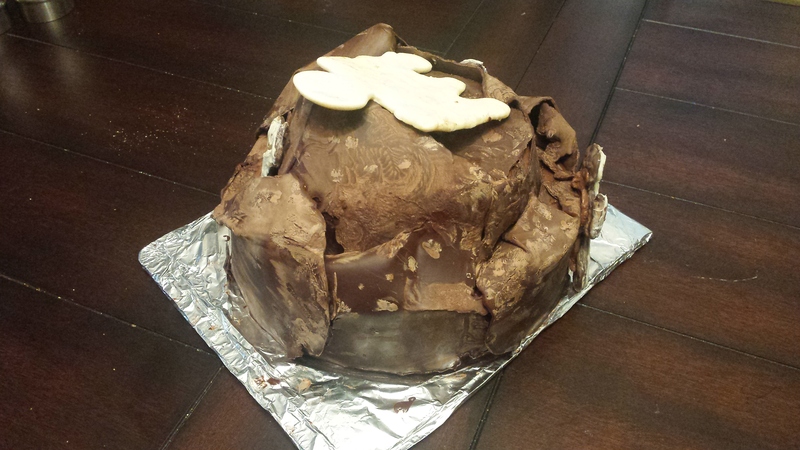 The poor tempering showed (either related to initial overheating thanks to the poorly chopped chocolate pieces in the tempering process or due to excessive heat from the blow dryer. What does poor tempering look like? Cool designs, sometimes. This should be uniformly brown, but at least there were a few interesting patterns in it. The longer it sat, the worse it looked. It was okay at first, and then it kept getting more and more discolored. I was so relieved when we finally decided it was time to eat it, especially since it turned out to be really delicious, and just the right amount of chocolate. And Ironwoman Vic appreciated it. This cake was super delicious and really did look cool too! I loved watching the process and REALLY loved my slice.